BLUE RIDGE, Ga. – Gov. 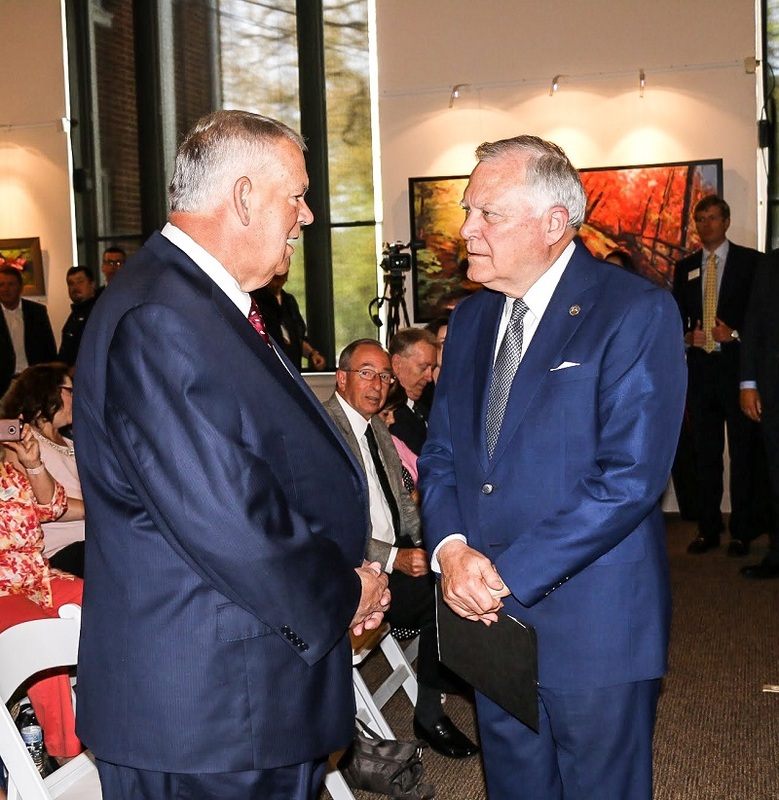 Nathan Deal made a stop in Blue Ridge Wednesday, May 2, to sign the state budget – House Bill 684 – for the 2019 fiscal year in Georgia and also bring good news for the University of North Georgia (UNG) Blue Ridge campus. The $26.2 billion budget, which Deal stated was the largest in the history of the state, will include $5.5 million for a permanent relocation project for the UNG Blue Ridge campus. 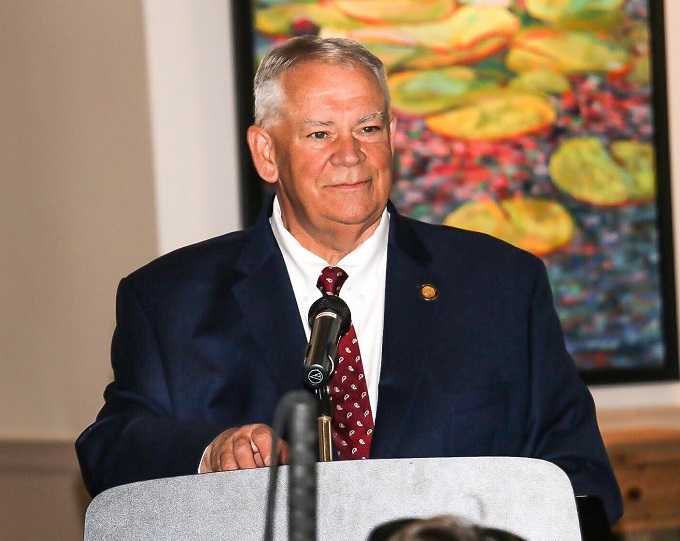 Also, during the budget signing, Georgia Speaker of the House and Fannin County resident David Ralston announced the location of the forthcoming facility to be just off of state Route 515 and east of Industrial Park Road. “When I came into office in January 2011, it was a bleak time in our state,” Deal explained of the state’s economy. As a result of the Recession of 2008, Deal went on to say, by the time he took office, the state revenue had dropped by 18 percent and the “rainy-day fund,” or reserves, was essentially depleted with only enough funds to keep the state government open for approximately two days. Since then, a dramatic increase in state revenue not only allows for a higher state budget in 2019 but also has allowed for a state income tax rate cut for the first time since the tax was instituted in Georgia in 1934, according to Deal. Deal also noted he expects another income tax cut to come again in 2019. Regarding the state’s “rainy-day fund,” Deal explained conservative spending has enabled the state to increase reserves to the current amount of $2.3 billion. “So, we are doing exceptionally well on many fronts,” Deal said. 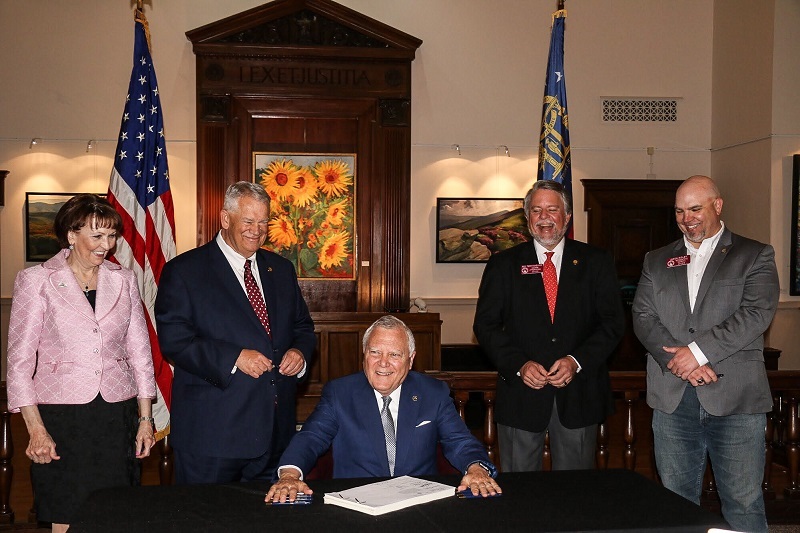 In his Blue Ridge stop, which was one of five locations across the state of Georgia the governor visited Wednesday to sign the budget, Deal focused his address on spending with regard to higher education. Deal explained the Recession of 2008 also affected state lottery proceeds for the Helping Outstanding Pupils Educationally (HOPE) Scholarship but announced the 2019 budget will add $68 million more to the HOPE program for higher education opportunities. The governor also stated the state currently has $1.1 billion in reserves for the HOPE Scholarship. Also, Deal told of the success of dual enrollment, which allows high school juniors and seniors to take college, university, or technical college courses at no cost to serve as credits toward both their high school diploma and a higher education degree or certificate. The 2019 budget provides $26.2 million for dual enrollment programs, Deal stated. The REACH Scholarship is another opportunity for students seeking higher education. According to Deal, the REACH Scholarship, which was launched in 2012, is needs-based and provides selected eighth-graders with a $10,000 trust account for future higher education. Promising students who come from families with limited financial resources are selected by teachers and school administrators, and once designated as REACH scholars, the students sign a contract agreeing to maintain a good grade point average, to meet with their mentors regularly and also not to partake in crime or drug use. In addition to the REACH Scholarship, Deal said every institution in the University System of Georgia, which includes 26 public institutions, has agreed to match the $10,000 trust account for REACH scholars. Since 2012, Deal explained, the state has invested over $689 million in the University System. In the 2019 budget, one of those University System institutions, the University of North Georgia, will not only receive $5.5 million for the Blue Ridge campus, but also $3 million in bonds to renovate its Oakwood campus in Hall County and $4.7 million in bonds to purchase property to expand its main campus in Dahlonega. “We know that there are many students who will take advantage of these opportunities, and when they do, it will help us to retain them in the state of Georgia. It will help them to have the credentials that will be necessary to get the higher paying jobs that are here today and be able to attract those jobs for the future. For a personal standpoint of a family, when your child gets those kind of credentials, the likelihood that they can stay in Georgia and not have to leave to find a good job is greatly enhanced,” Deal concluded. Introducing Gov. 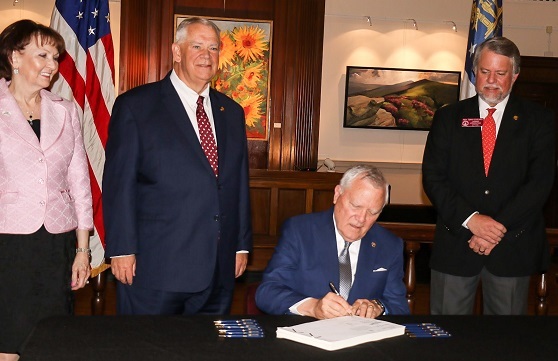 Deal at the engagement held at the Blue Ridge Mountains Arts Association Art Center, Speaker Ralston called the event “historic in many respects,” being the first time in the history of Fannin County that a state budget bill has been signed within the county. For Fannin County, Ralston explained the 2019 budget will provide over $273,000 to the Fannin County Board of Education. Statewide, Ralston stated, over $360 million will go toward the state’s teacher retirement system. Also, statewide public school campus funding will account for $16 million, over $44,000 of which will go to Fannin County, according to Ralston. Additionally, the budget will provide $25,000 in bonds to renovate the community center in Epworth and $277,000 for a new roof at West Fannin Elementary School. 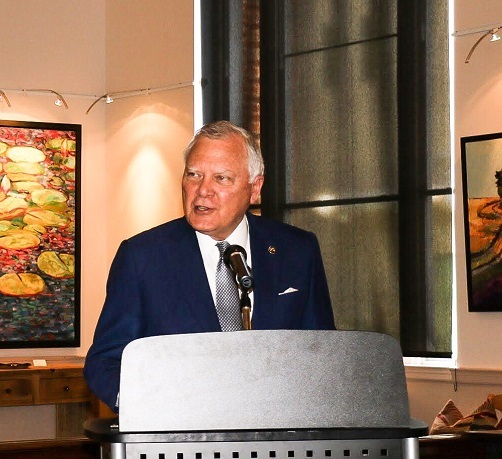 “And today, I guess the highlight of the event is, (the budget) contains $5.5 million for the new, permanent campus for the University of North Georgia at Blue Ridge,” Ralston announced. After announcing the aforementioned location, Ralston explained the contract is pending final approval from the Board of Regents, which is expected to occur within the next 30 to 45 days.